This gown is nothing short of regal beauty. 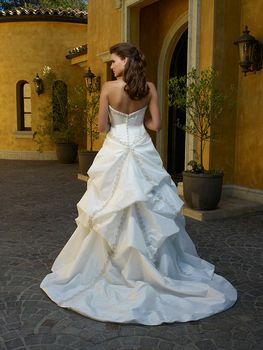 A strapless neckline and rounded waist are embellished with intricate beads and cystals. A distinct A-line skirt is softened with beaded applique accented gathers. The candy buttons line the back of the bodice with bands and cystals creating an illusion of a split chapel train.